The map above shows the zones and evacuation routes. Roads with directional arrows indicate suggested routes in the event of an evacuation. Please locate the Emergency Planning Zone (EPZ) in which you reside and familiarize yourself with the suggested path of evacuation. Those residing in EPZ 3 should follow the route south through Chesapeake Ranch Estates. 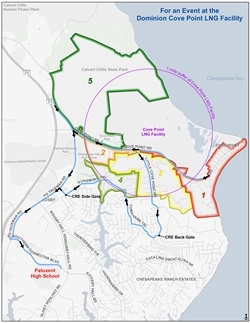 Emergency Planning Zone 5 (EPZ-5) is the Calvert Cliffs State Park, Cove Point Park and the Chesapeake Hills Golf Course will be closed and the patrons directed to leave the area or if their home is in the evacuation report to Patuxent High School. Patuxent High School has been designated as the mass care facility in the event of an evacuation. Patuxent High School is located at 12485 Southern Connector Boulevard, Lusby, MD 20657. Alternate or additional mass care centers may be established based on the situation at the time of the emergency.